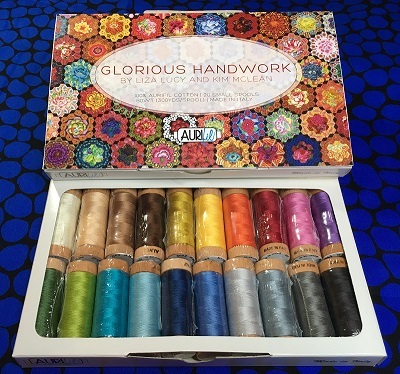 This Glorious Handwork set includes twenty 300-yard 80-weight spools, one in each of the following colors: 4241, 2026, 2315, 2340, 2360, 2615, 2610, 5004, 2783, 2725, 2805, 2810, 2890, 1231, 5022, 1135, 1154, 2479, 2260, 1243. These are specially selected by Liza Lucy and Kim McLean to make your applique and English paper piecing sewing easy and invisible. They blend with most of the Kaffe Collective fabrics and are a great way to make sure you have the right color on hand.